Tomcat could serve SSL content properly. As an Http client, the JVM could accept a self-signed (untrusted) certificate. If you’ve ever come across a website that asked you if you want to accept an untrusted certificate, this is basically the same thing, but there’s no UI to import certificates into the JVM. Create a self-signed certificate using keytool. The following command generates a certificate keystore with one self-signed certificate inside it with filename keystore. I used the password “changeit”, but you can use whatever you want. Just make sure the Tomcat configuration uses the same. Import the cert into the JVM. “cacerts” is the filename of the JVM keystore. The path will be different on Windows (should be in %JAVA_HOME%/jre/lib/security/cacerts). Check to see that the certificate was properly imported. # Set the preferred protocol. # guest user and the authenticated user to have the same session. # Set this to false if the property "company.security.auth.requires.https"
# other portals that do not share the same secret. # Secrets must be 16, 32, or 64 characters long. # "main.servlet.https.required" on how to protect this servlet. When Local staging is enabled then clone is created as site pages containing the content and portlet data. Original site becomes live and clone will become staging environment. 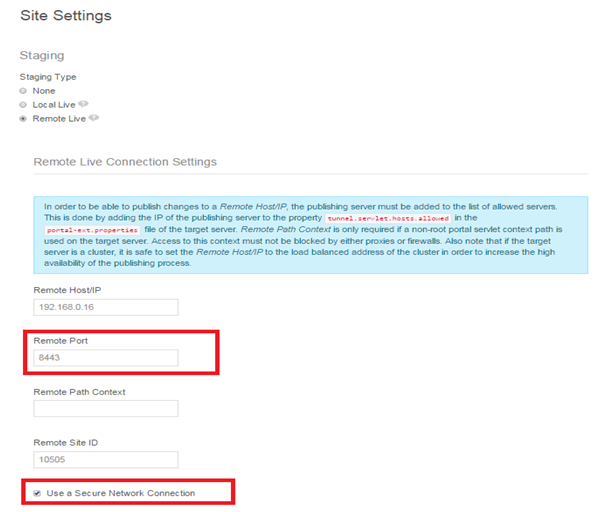 When Remote staging is enabled then there will an establishment of connection between current site and site on remote Liferay server. Remote site becomes live environment and current site becomes staging environment. When you enable Remote Live staging, the remote site becomes the live environment and the current site becomes the staging environment. The remote (live) Liferay server and the local (staging) Liferay server should be completely separate systems. They should not, for example, share the same the database. When Remote Live staging is enabled, all the necessary information is transferred over the network connecting the two servers. Same settings need to be replicate in both thenodes (Liferay node1 and node2). Liferay’s use of a pre-shared key between your staging and production environments helps secure the remote publication process. It also removes the need to send the publishing user’s password to the remote server for web service authentication. Using a pre-shared key allows Liferay to create an authorization context (permission checker) from the provided email address, screen name, or user ID without the user’s password. You can specify any value for the tunneling.servlet.shared.secret property; the value for your current server just has to match the value of your remote server. Remember to restart both Liferay servers after making these portal properties updates. After restarting, log back in to your local Liferay portal instance as a site administrator. Then navigate to the Site Administration → Configuration page for your site. Next, click on Site Settings in the left menu and then on Staging listed under the advanced tab. Select Remote Live under Staging Type and additional options appear.